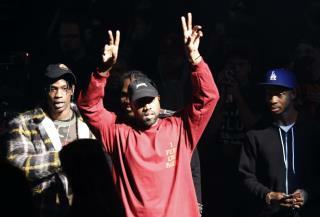 (Newser) – Kanye West was considering legal action against the Pirate Bay last month after his album, The Life of Pablo, became a hot illegal download—but apparently that doesn't mean he's above a little piracy himself. On Tuesday, the rapper tweeted a photo showing that he was listening to a Sufjan Stevens song on his computer. But, as Ars Technica points out, a close examination of the photo shows a few other suspicious browser tabs that, taken together, indicate he was attempting to illegally download Serum, music editing software that costs $190. One of the tabs reads "Pirate Bay Torrent," although Ars Technica thinks he was actually using a rip-off version that goes by the same name as the "real" Pirate Bay torrent site. He has to use something...nobody using his crappy site. The pic of him and his crew says it all.